To change the color temperature of a scene (make it look warmer or cooler) during a shoot, photographers use colored lens filters. You can simulate the effect of these filters in Photoshop via a Photo Filter adjustment layer, either to neutralize an unwanted color cast or to apply a tint (as a special effect). Choose from among the 20 preset tints that are offered, or choose a custom color. When you use this feature, we recommend aiming for subtle (sophisticated) or extreme (so it looks deliberate), but not in between. 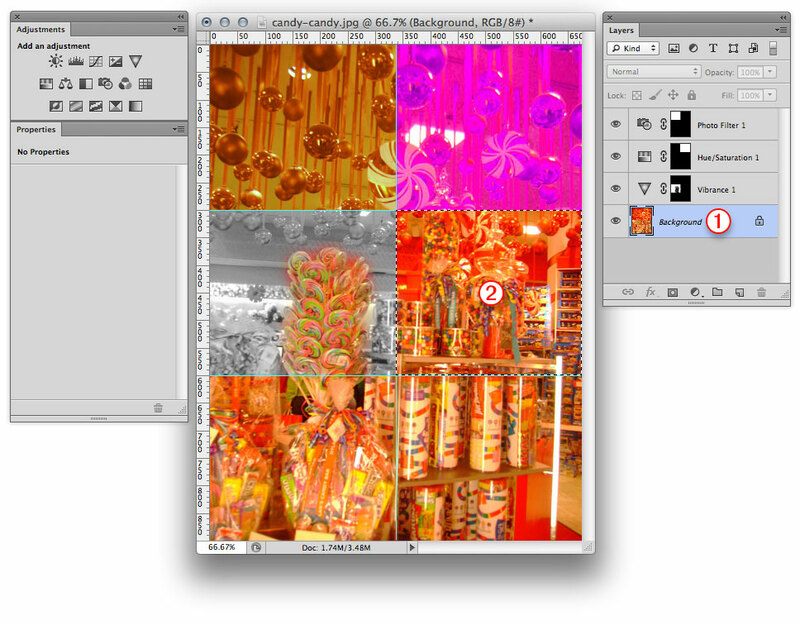 If you go for in between, you will simply give the image an ugly color cast. 1. Make a selection on a layer or the Background. 2. On the Adjustments panel, click the Photo Filter button. The Photo Filter controls display on the Properties panel. Click Filter, then from the menu, choose a preset warming or cooling filter, or a filter color. The current filter color displays in the swatch. 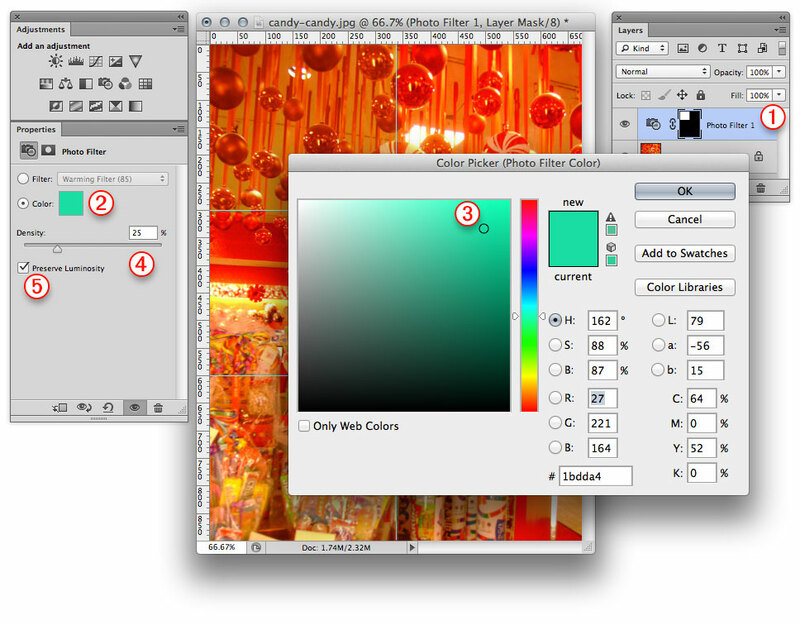 Click the Color swatch, choose a color for the filter via the Color Picker, noting the change in the image, then click OK.
For a subtle change, pick a color that is similar to colors in the image. Or for a more striking change, pick a color that is complementary to the predominant colors in the image (one that is on the opposite side of the color wheel -as in red/green, blue/orange, purple/yellow). 4. 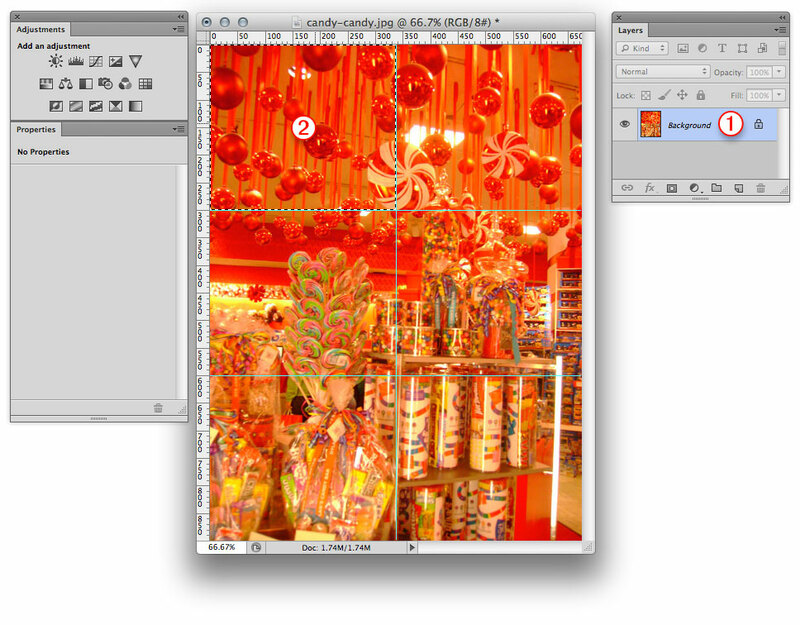 Using the Density slider or scrubby slider, choose an opacity percentage for the tint. Try a modest value between 10% and 25% first. You can also lessen the Photo Filter effect after using the Properties panel by lowering the opacity of the adjustment layer. 5. 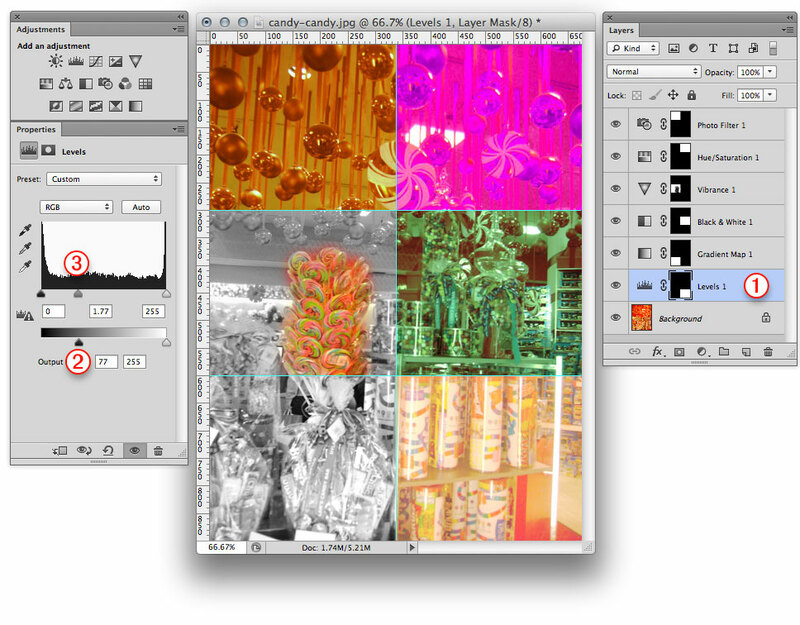 Check Preserve Luminosity to preserve the over-all brightness and contrast values of the image. 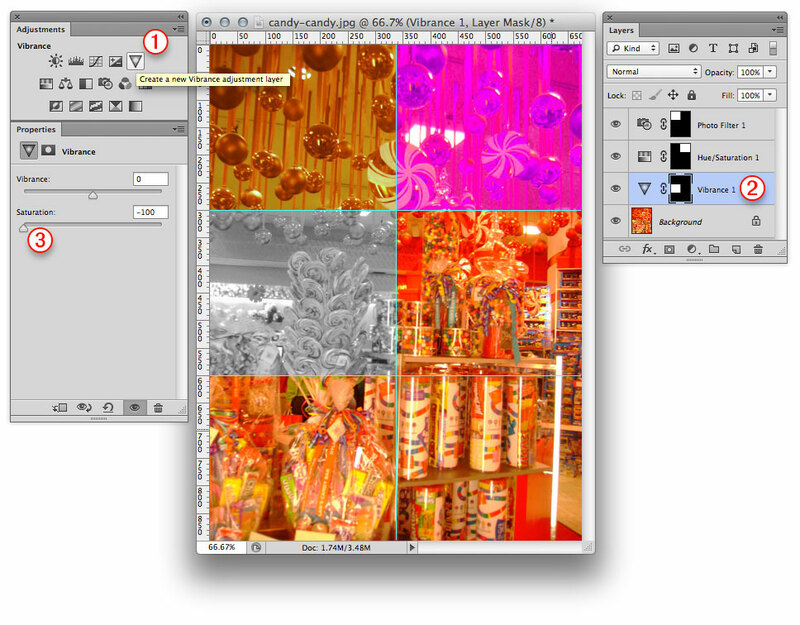 With this option unchecked, the highlights may be softened, but the resulting colorization effect may be too pronounced. Via a Hue/Saturation adjustment, you can apply very targeted hue, saturation, and lightness corrections without having to create a selection. This is a very useful command. 2. On the Adjustments panel click the Hue/ Saturation button. The Hue/Saturation settings display on the Properties panel. To correct all the colors in the image, keep Master as the choice on the second menu; to adjust a specific color range, choose that color on the menu. 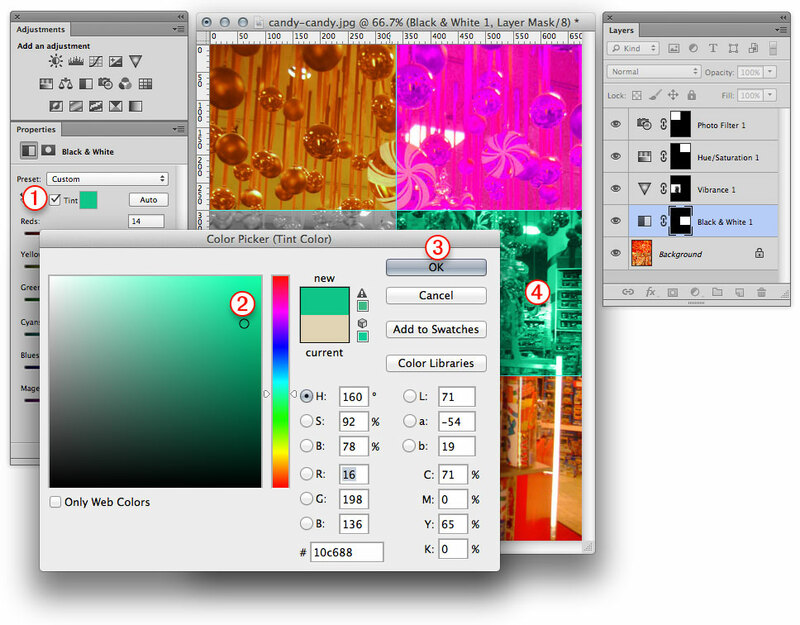 Move the Hue slider to adjust the hue(s), the Saturation slider to adjust the color intensity, or the Lightness slider to lighten or darken. If you adjust the Lightness, you may need to increase the Saturation to revive any colors that were lightened or darkened. To change a hue, click the Targeted Adjustment tool on the panel, then Ctrl-drag/Cmd-drag horizontally over the color area in the image that you want to adjust. The color range you dragged over is now listed on the menu, and the Hue slider shifts on the panel. Or to change the saturation of a color range, drag horizontally with the same tool over a color area in the image without holding down Ctrl/Cmd. 2. On the Adjustments panel, click the Vibrance button. The Vibrance settings display on the Properties panel. 3. Reduce the Saturation to the lowest value of -100. 4. Choose the Brush tool and on the Options bar, choose a Soft Round brush, Normal mode, and an Opacity of 5O% or less. Choose black as the Foreground color. 5. Adjust the brush diameter, make sure the mask thumbnail is still selected on the adjustment layer, then apply strokes where you want to restore the original colors. You can change the brush opacity and diameter between strokes. To restore desaturated areas, set the brush Opacity to 100%, and paint with white (press X to swap the colors). 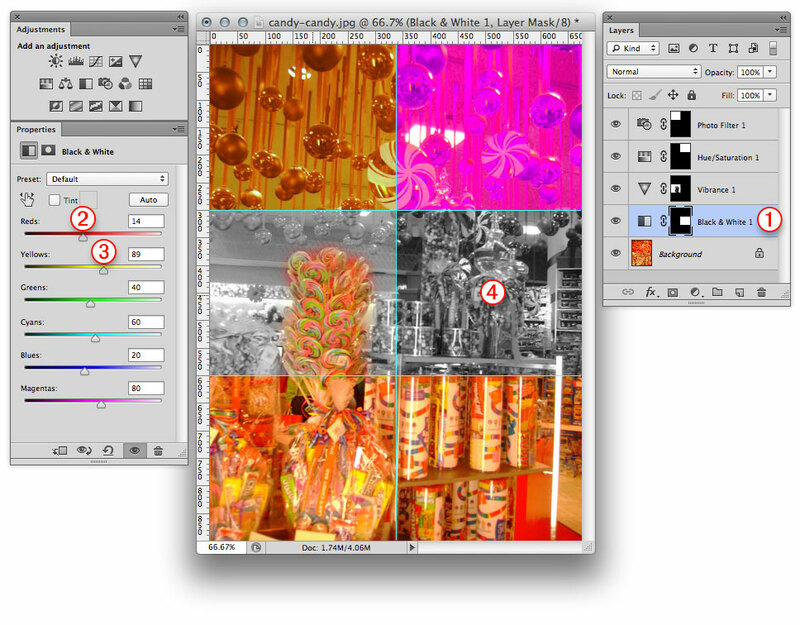 Our preferred way to strip color from a layer is via a Black & White adjustment. With this awesome command, you can control how the individual R, G, B and C, M, y color channels are converted to grayscale values. As an added option, you can apply a tint. Note that this feature has no effect on the document color mode. 2. On the Adjustments panel click the Black & White button. The Black & White controls appear on the Properties panel. Adjust any of the sliders. A lower value produces a darker gray equivalent for a color; a higher value produces a lighter gray equivalent. For example, you could use the Yellows slider to lighten or darken the skin tones in a portrait or move the Cyans and Blues sliders to adjust the sky in a landscape. Click the Targeted Adjustment tool in the panel, then drag to the right in an area of the image to lighten that shade, or to the left to darken it. The slider corresponding to the predominant color in that area will shift accordingly. 4. 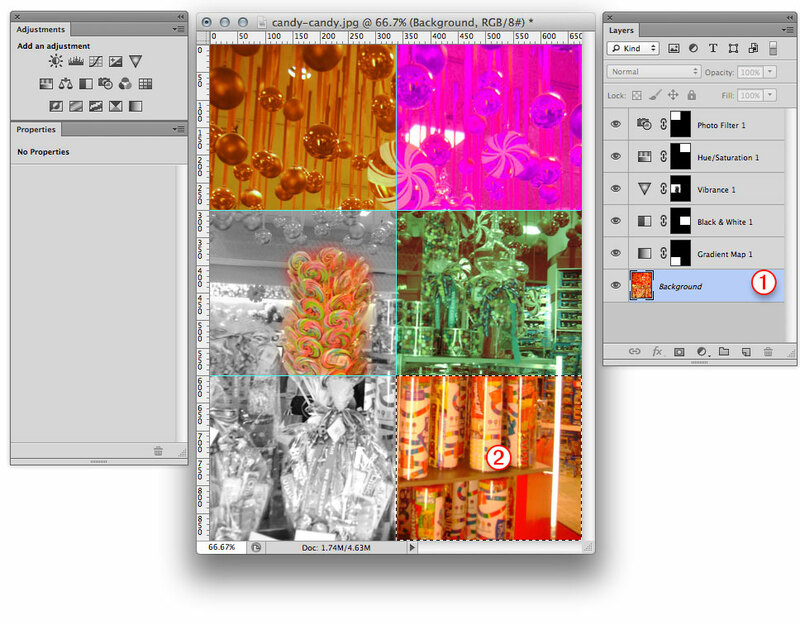 To apply a tint to the image, check Tint, click the color swatch, choose a color in the Color Picker, then click OK.
5. Optional: To restore some of the original color to the whole layer uniformly, lower the opacity of the adjustment layer. To restore color to specific areas, click the adjustment layer mask thumbnail, choose black as the Foreground color then with the Brush tool, apply strokes to the image (for a more subtle effect, lower the opacity for the tool first). 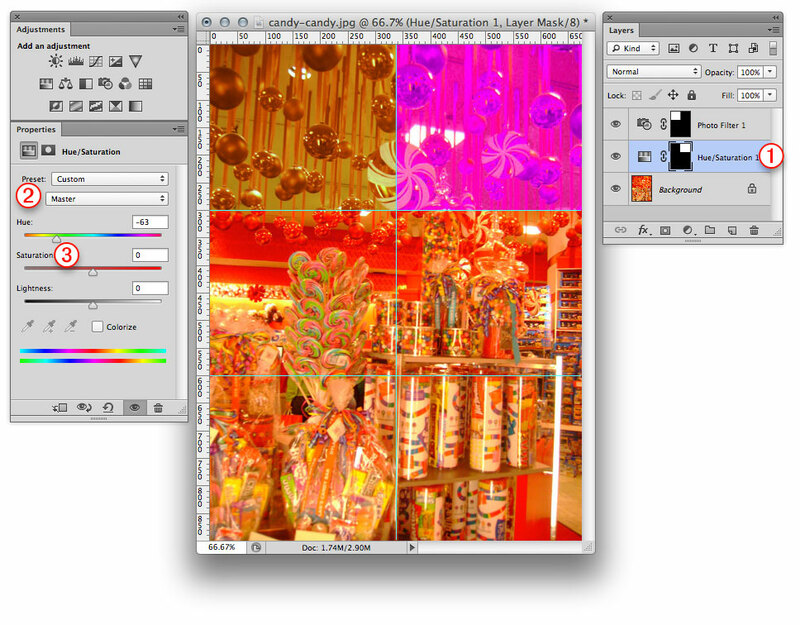 A Gradient Map adjustment matches luminosity values of colors in a gradient to luminosity values in an image, replacing one with the other. It produces beautiful effects with little effort (you can look like a Photoshop pro even if you’re not one – yet!). This is a fun feature to experiment with. 2. 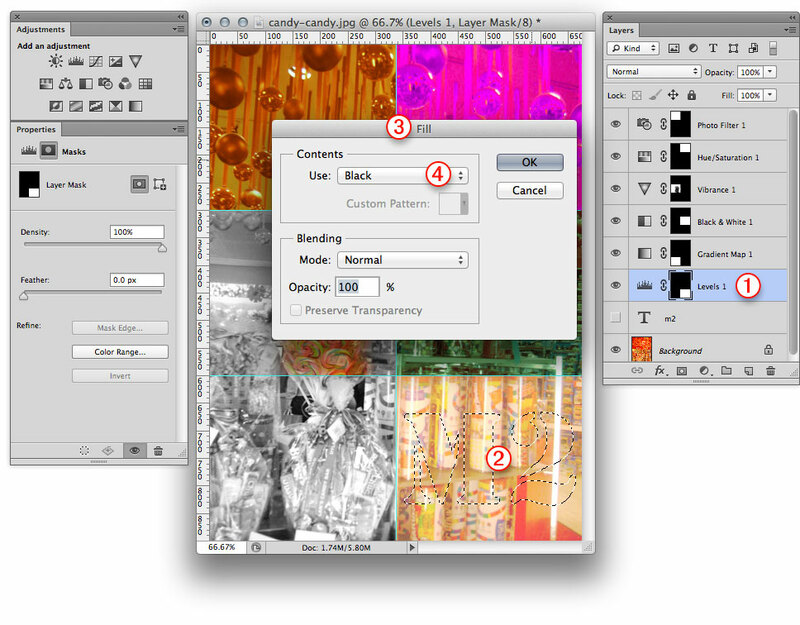 On the Adjustments panel click the Gradient Map button. 3. 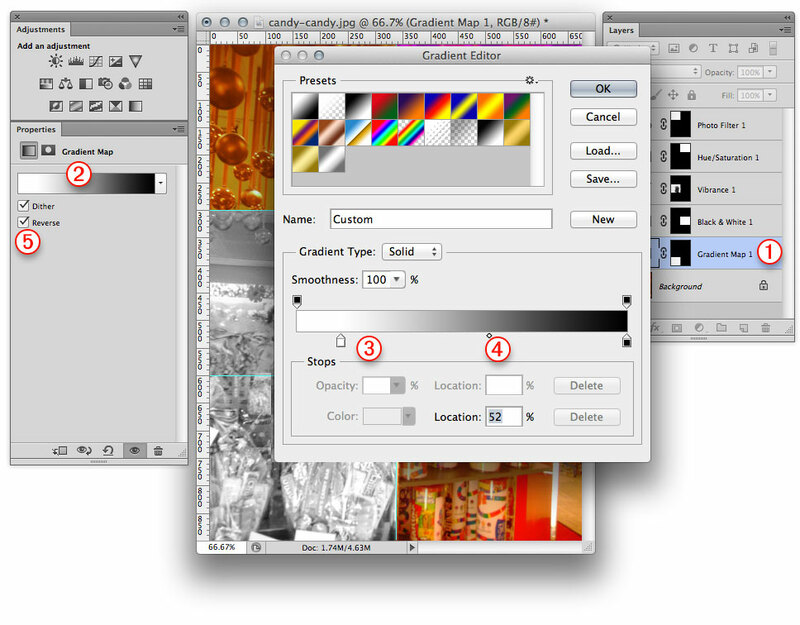 Click the Gradient thumbnail to open the Gradient Editor, then edit the gradient (e.g., add or change some color stops, or reposition some stops or midpoint diamonds). 4. Optional: Check Reverse to apply the lightest colors in the gradient to the darkest values in the image, and the darkest colors to the lightest values in the image (the opposite of the default behavior). 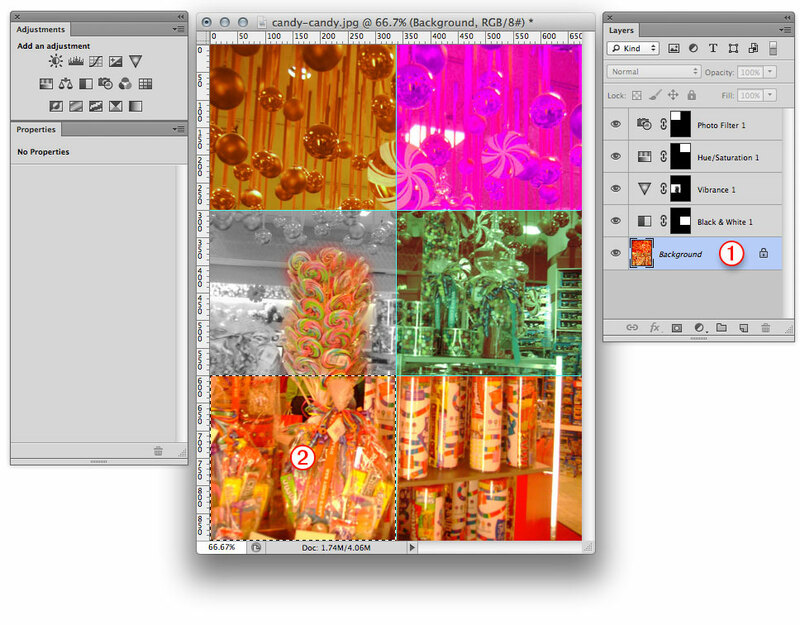 If the gradient contains dark colors, this option may produce a “film negative” effect. When printing dark text or a logo on top of a photo, you need to make sure the picture is light enough for the text or logo to be readable, but not so light that the image content isn’t discernible. 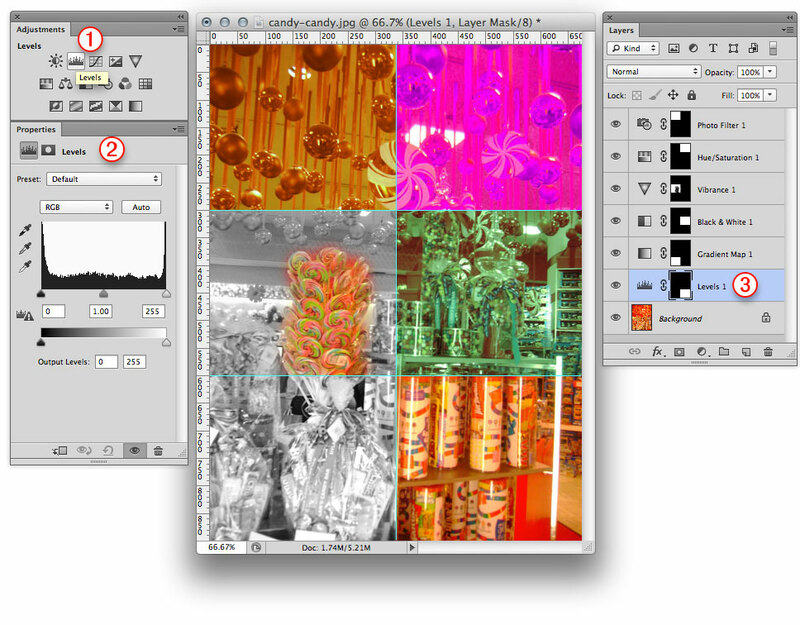 To achieve both objectives, you can screen back (lighten) an image layer or a selected area of an image layer-via Levels. 2. On the Adjustments panel, click the Levels button. Levels controls display on the Properties panel. 3. To reduce contrast in the image, move the output levels shadows (bottom black) slider to the right. 4. 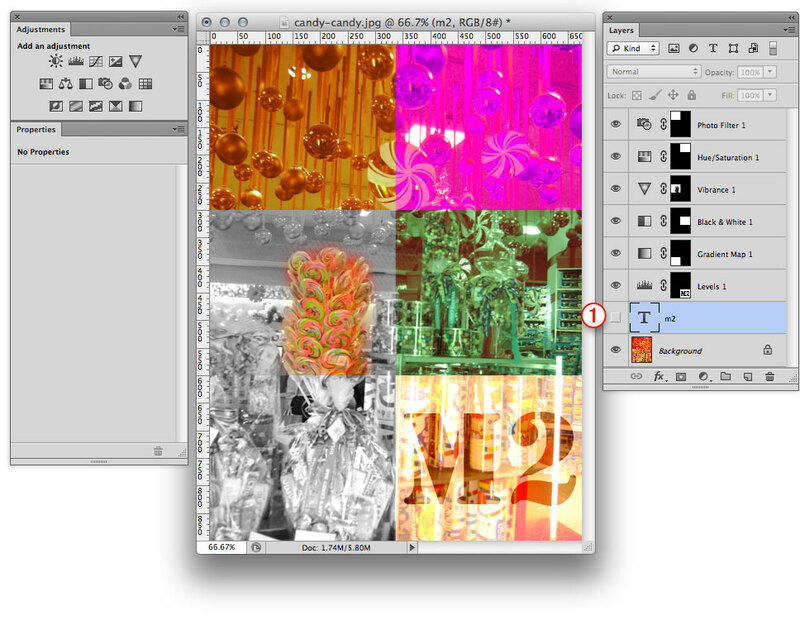 To lighten the mid-tone values in the image, move the input levels mid-tones (gray) slider to the left. I created a text layer (my initials) and in the Layer panel made a selection (2) by right-clicking on the text thumbnail and choosing Select Pixels. Then click on (1) Levels 1 Mask thumbnail. From the top menu (3) Edit > Fill dialog box – chose (4) Use: Black. With the image screened back, the type is more eye-catching and easier to read. (1) The text layer’s visibility icon has been switched off.